Plantation grown, FSC and PFC certified. 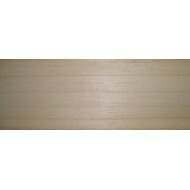 Tight grained creamy-white to pale yellow coloured wood. Its fine and even texture make sit very easy to work. Very popular with model makers and miniaturists.